One of the first tourist guides to Scotland is being brought back to life two centuries after it was published. A Perthshire photographer has revisited the places shown in the book Scotia Depicta and updated the engraved architectural and scenic pictures. 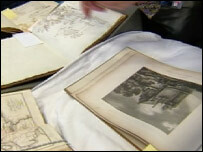 The images Jo Cound is updating were sketched by British artist John Claude Nattes in 1799. They were then engraved to appear in the book five years later. Ms Cound's pictures are developed and printed in a non-digital dark room. When the original book was printed, tourism in Scotland was just beginning and the Napoleonic Wars meant the wealthy could not travel abroad. It is hoped the updated version, showing "before and after" images, will be published later this year.